Properties in Zaudin Golf Club average 4.5 out of 5 stars. CASA RURAL ALCORES. ACCOMMODATION 3. Property 5: CASA RURAL ALCORES. 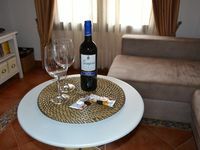 ACCOMMODATION 3. Well Loves. Rural house, Doñana National park. Dew. Property 7: Well Loves. Rural house, Doñana National park. Dew. Rural house the Ferris wheel ..
Property 8: Rural house the Ferris wheel ..
Property 9: CASA RURAL ALCORES. ACCOMMODATION 2. OFFERS!! 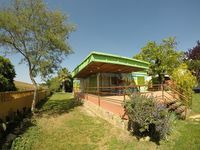 RURAL HOUSE WITH POOL 25km FROM SEVILLA. WIFI, A / C BIKES. Property 10: OFFERS!! RURAL HOUSE WITH POOL 25km FROM SEVILLA. WIFI, A / C BIKES. Large and bright triplex ideal for 6 people just minutes from the Cathedral. Property 18: Large and bright triplex ideal for 6 people just minutes from the Cathedral. El Tamboril House Cozy house between Seville and Doñana. Property 28: El Tamboril House Cozy house between Seville and Doñana. CORTIJO LA SIÑUELA, 14 Kms. From SEVILLA. Property 31: CORTIJO LA SIÑUELA, 14 Kms. From SEVILLA. Large house on two floors ceramic and marble throughout new appliances efficient kitchen with all needed to cook, washer dryer two bathrooms one w shower other with large tub, excellent lighting throughout, parking a little tight, window covers very good allow sleeping late, excellent host Rueben and Katy comun&iacute;cate constantly providing all details on local dining and events and household effects... Martha and i and our 21 year old daughter throughly enjoyed Easter week in Sevilla and Villamanrique!! Great location, cool house, fun wall paper, owner is great.